This past Wednesday I had my GJ-tube replaced. We do this in Interventional Radiology under mild sedation. We usually struggle because my stomach begins “absorbing” the balloon that holds the tube in place so it takes a good bit of maneuvering and is usually pretty painful. Because of this difficulty, we have a standing appointment scheduled every two months so my stomach doesn’t absorb the balloon too much. This time was the most difficult. My jejunum wasn’t cooperating and the guidewire broke while still in my stomach. My O2 rapidly dropped to 72 and my heart rate rose to 165. The end product is that Interventional Radiology refuses to do another GJ change without general anesthesia so they can properly control my body’s reactions. Within an hour after the procedure, my fever started. For the next two days, I ran a fever around 101-102 despite the use of tylenol suppositories every 4 hours. I really wasn’t feeling very sick other than the fever and a slight sore throat so I kept putting off the ER, insisting that I had IV fluids at home so I was fine, and my fever even broke for four glorious hours on Friday. We went to bed feeling the fever was due to a passing virus. The next morning we went over to Stef and Ralph’s to meet with two wonderful new friends in the mito world. About 15 minutes after we got there we realized my fever was still raging. I popped in a tylenol and prayed it would pass. After almost two hours, it was higher and I was feeling worse. Long story short, that afternoon and night brought on fevers as high as 103.5 through the tylenol, mildly elevated lactate levels, the discovery of a pancreatitis flare and gallbladder dysfunction, and a really delirious Chelsea. The worst (or possibly best) part was that I was so confused and generally out-of-it that I don’t really remember much but the pain. Thankfully, I have Keith to remember the important stuff. Apparently my floor doctor was really nice and a nurse rubbed my back with oils. After just a few hours of drawing the cultures, gram positive cocci was growing. We are still waiting on sensitivities to antibiotics but we’ve been running Vanco, Cipro, and one other new-to-me drug trying to break the fever. Over 24 hours after I went septic I was still running fevers of 100.8-102.1 despite tylenol and ice packs. I was having short bursts of clearness and I even got halfway through a game of Zombie Fluxx with Keith before vomiting all over the bed/playing surface. But on whole I was still pretty confused and quite in pain. Fortunately, I did get the chance to speak with both my mom and my dad. This morning we are on our forth course of Vanco and my fever just broke a couple of hours ago. I can’t tell you how good that feels. Especially because it was running 102-103 the entire night before it broke. I’m still having difficulty with words (i.e. finding the correct ones), but thanks to Keith I have a walking lexicon and I’m hoping that it’ll pass with time as my body gets stronger. I’m planning on using how good I feel to rest up since I know I haven’t been sleeping well just based on how I’m feeling. Better, but exhausted. Today we’ll see infectious disease (ID) about the identified Staph aureus in my blood (hopefully after we discover the sensitivities that will include the Vanco) and even more hopefully we’ll discover it’s not Methicillin-resistant, aka “MRSA.” Finally, today will include a blood transfusion as my “moderate anemia” became “severe anemia” and can no longer be ignored. Reflecting on the past few days, I realize just what it means to rely on a central line. Yes, my lines have brought me life. But that’s not without significant risks. I am grateful that they have been (so far) relatively minor. I have so many friends that have not been as lucky when greeted with sepsis. Will I lose my current line (a double-lumen Bard power port)? Yes. But it’s a small price to pay. This is what makes HPN Awareness Week so important to me. HPN is never (and shouldn’t ever be) something to be taken lightly. HPN gives so many life; but the central lines involved also threaten many lives. PS I’m doing better, Daddy! Happy birthday!!! Chelsea, what a trouper you are…..you indure great adversity with such grace. Thank you for raising awareness. Thinking of you, hope you feel better soon! Sounds like a very very rough couple of days! I wanted to say that I appreciate this posting. I am wondering if we can post a link to it on the Oley Web site. 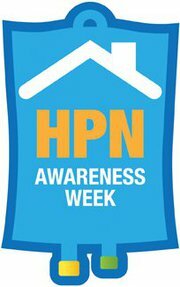 We’ve got a page dedicated to HPN Awareness Week (http://www.oley.org/HPN_Awareness.html) and this blog enty would be a great addition.